courtesy ScienceDaily – Aug. 19, 2013 — The quadcopter, which was developed at TU Vienna, can negotiate its way through a room completely on its own. 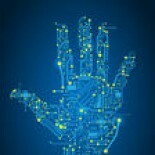 It does not need any human interference, and in contrast to other models, it is not assisted by any external computer. All the necessary computing power in on board; the image processing is done by a standard smartphone. Quadcopters have become a popular toy for academic research. The small aircraft, powered by four electrical engines, are perfect for testing advanced feedback control systems, which make them fly steadily and safely. But beyond that, quadcopters are also used to test how machines can be made to perceive their environment and act autonomously. The Virtual-Reality-Team at Vienna University of Technology has been working with visual data for many years. “Proceeding towards robotics and mounting a camera onto a quadcopter was just the logical next step for us,” says Hannes Kaufmann (Faculty of Informatics, TU Vienna). Usually, quadcopters are steered by humans or they send their data to a powerful earthbound computer, which then returns the necessary control signals. The Vienna quadcopter, however, does not need any external input. The team decided not to buy an expensive commercial quadcopter-system, but instead to assemble a simple, cost-efficient quadcopter, using carefully selected components. The core element — and the most expensive part of the quadcopter — is a smartphone. Its camera provides the visual data and its processor acts as the control center. The quadcopter’s intelligence, which allows it to navigate, was coded in a smartphone-app. In addition, a micro controller adjusts the rotor speed, so that the quadcopter flies as steadily as possible. The quadcopter was designed to work indoors, even in small rooms. This is a major challenge; especially close to walls or corners, aerodynamics can be much more tricky than in open space. Apart from that, the quadcopter cannot make any use of GPS data, it has to rely entirely on visual data. 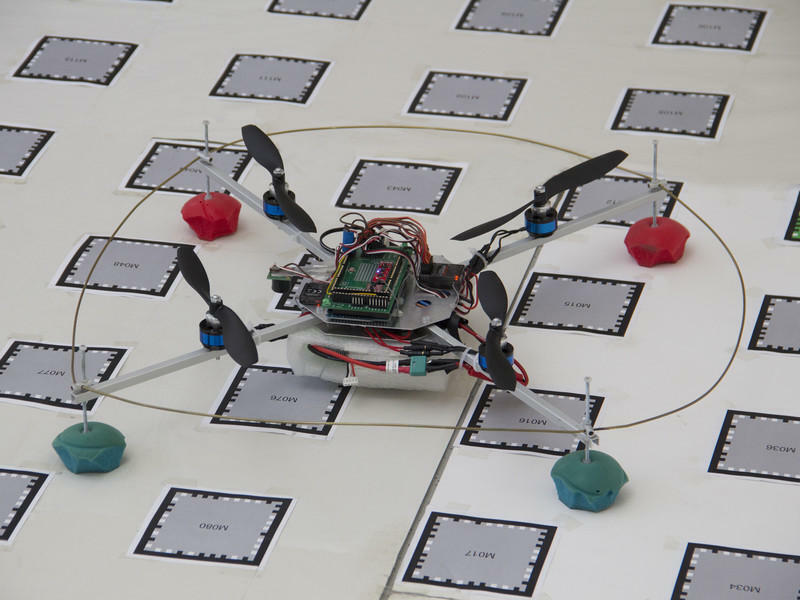 To test the quadcopters navigational capabilities, the team attached visual codes to the floor, similar to QR-codes. Hovering above these codes, the quadcopter recognizes them, obtains information and creates a map of its environment. Once it has created a virtual map of the codes on the floor, it can head for a specific known location or go on exploring areas it has not yet checked out. “In the future, the quadcopter should also be able to do without these codes. Instead, we want it to use naturally occurring reference points, which can be obtained from the camera data and also from depth sensors such as the MS Kinect,” says Annette Mossel, chief engineer of the quadcopter project. She developed the device together with her diploma students Christoph Kaltenriner and Michael Leichtfried. There are many possible applications for an autonomous quadcopter; firemen could send it into a burning building and have it transmit a 3D picture from inside before they enter the building themselves. Miniature quadcopters could guide people to the right place in large, labyrinthine buildings. Due to its low price, the smartphone-quadcopter could also be used in less wealthy regions of the world — for instance to monitor illegal forest clearance without having to use expensive helicopters. The components of the quadcopter are less than a thousand Euros, says the team. However, the many months of work, which were spent designing the electronics and developing the computer programs, are not included in this calculation. The above story is based on materials provided by Vienna University of Technology, TU Vienna. This entry was posted on August 26, 2013 by techinamerica in ROBOTICS and tagged Global Positioning System, Kinect, QR code, Quadrotor, Smartphone, Vienna, Vienna University of Technology, Virtual reality.